The city council approved the Special Tax District map for the upcoming referendum to raise property taxes by 3 mils to supplement area schools. Registered voters living in the green area will be able to participate. 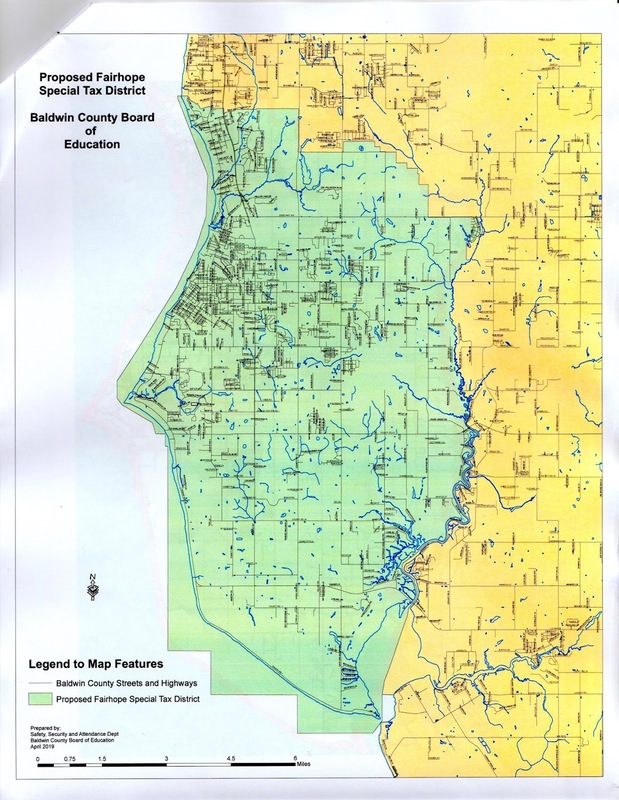 The Baldwin County School Board and County Commission will also have to vote to approve the map and referendum. 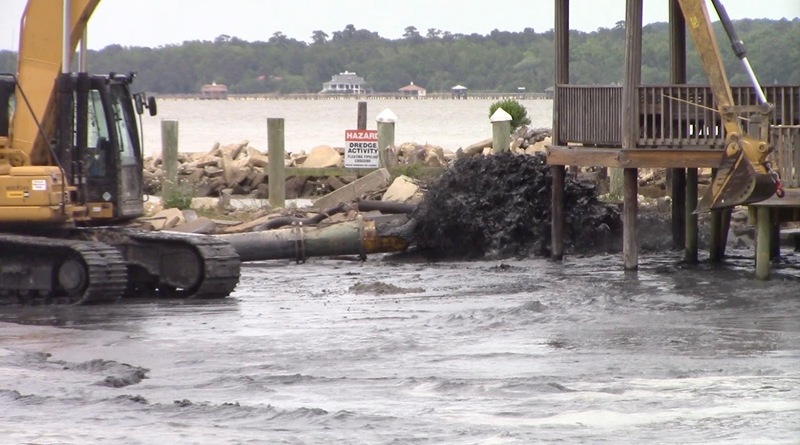 The material being removed from the Fly Creek boat channel smells like it looks: oily. 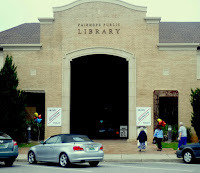 Fairhope Ave. at Fairwood Blvd. 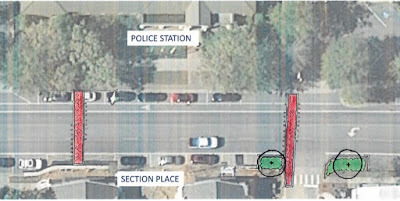 Public Works Director Johnson brought engineering designs for the three pedestrian safety projects in the downtown area that were proposed last year but the $1.01 million total cost estimate was a concern for some council members (including a $100K contingency). 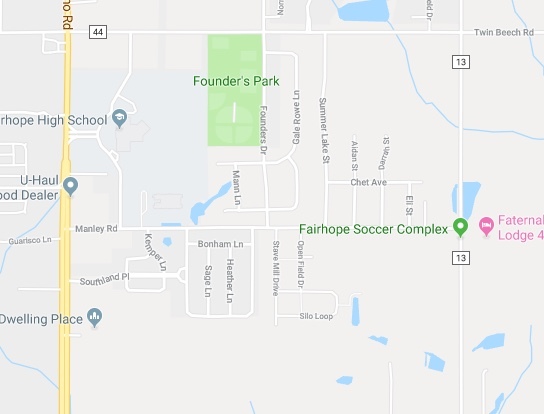 * $366K for the Fairhope Avenue/Fairwood Blvd. intersection including textured pavement and crosswalks, islands, and a 3-way stop. 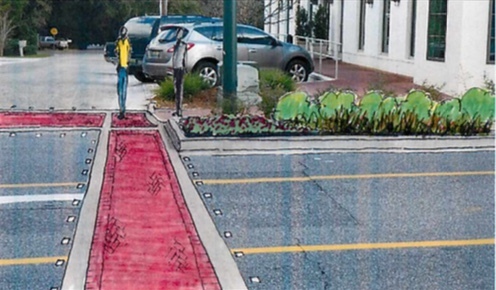 * $248K for a center lane textured (natural stone pavers) safety strip on S. Section Street and for modifying the De La Mare and Johnson Avenue intersection crosswalks/pedestrian landings. * $80 K for two, textured LED crosswalks and new pedestrian landings on N. Section Street in the vicinity of Pine Avenue and the Police Station. Councilman Conyers wanted to know if any grants were available to help with funding and was told there are not. Johnson said the smaller Pine project should go quickly, but asked and got the go-ahead to seek bids at the same time on the other two as well (as separate projects with the option of using cheaper alternate materials) ... and the council could decide what to do about them at a later date. Council president Burrell added he thought "it all is needed" though. The city ordinance prohibiting posting advertising signs on city right of ways (and other public property) may be changed to allow them in certain circumstances; the ordinance has been on the books for over a decade but has not been enforced very strictly until recently when numerous signs began "popping up" in flowerbeds around town on weekends ... triggering complaints from citizens. Terryl Reeves, a director of the Baldwin County Association of Realtors, asked the city council during a recent work session to consider allowing a maximum of two (per house) off-site real estate sale directional signs on city right of ways from 5 PM Friday until 5 PM Sunday ... but not in flowerbeds or other unspecified "beautification" or similarly landscaped areas. Reeves said such signs just indicating homes for sale are less important these days in the era of GPS and smart phones; but are still "very important" for advertising open-house events, usually on weekends. Due to a recent Supreme Court ruling, Planning Director Dyess said any changes would have to apply to all other types of signs as well (yard sales, charity fundraiser events, sports, etc.) and "cluttering the right of ways" with too many is his main concern. 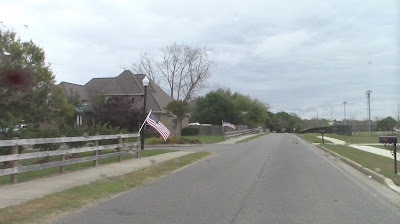 Dyess said his department would "put some thought to it" and consult with city attorneys before bringing something back to the council for approval; precise descriptions of the areas where the signs will be excluded to be determined. Reeves said the Realtors Association would help facilitate its development ... and educate its members about correct compliance. "We will push it out and help educate them about whatever you come up with." Stop signs have been installed on Manley Road at Founders Drive and Aidan Street per the Traffic Committee's recommendation. The city's Environmental Committee met last week to discuss ways to support proposed sewage system upgrades to minimize spills and overflows during storms when rainwater seeps into leaky pipes overwhelming system capacity. Operations Director Peterson asked the rhetorical question "does Fairhope want to have top-of-the-line utilities," ... then emphasized how replacing/relining the old leaky pipes, adding new side stream temporary storage tanks, new controls and monitoring, and even supplementary treatment facilities away from the bay need to be considered to deal with expected future growth; but most of those still are in need of funding sources. With current growth rates, the sewage treatment plant will reach capacity (4 million gallons/day) in about 10 years and long-term planning should begin now; a $10 million RESTORE grant (BP oil spill fine money) has been applied for ... but considerably more will be needed to address all of the issues to keep local waters as clean as possible, he said. A committee member said encouraging citizens to conserve water (low flow toilets, shower heads, etc) and re-using gray water (from bath, shower, sink) should be considered too. * The committee continued discussing ways to implement a testing plan for bacteria in the bay and local waterways. * Member Mike Shelton mentioned a new study of expected adverse effects of rising sea levels in the northern Gulf of Mexico. Dredging of the Fly Creek boat channel is about to get underway; at last word, the material was to be piled on the beach-area to drain then taken to the city landfill. 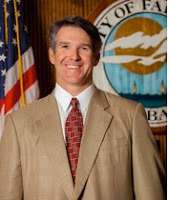 Fairhope city councilman Robert Brown said more than enough signatures have been obtained to submit the petition for a special school tax district to the Baldwin County Board of Education for its approval ... and then on to the County Commission so that a date for the voter referendum may be set, probably late September. Last month, the city council unanimously approved terms of the district referendum to allow voters the opportunity to increase their property tax earmarked for schools by three mills, to be exclusively used in the Fairhope feeder pattern -- and focused on providing additional math and reading instruction where test scores show help is needed. The goal according to the city's Educational Advisory Committee is to bring Fairhope schools into the top ten in the state, based upon standard testing. Brown is the council's representative on the EAC; he is also a partner in Pittman/Brown Home Builders Company and past president of the Baldwin County Home Builders Association ... as well as current Vice President of the Home Builders Association of Alabama. The city's flower clock is out of commission due to a bad (seized) bearing and stripped gear, according to public works director Johnson. The mechanism has been sent back to its manufacturer, Elderhorst Bells of Palm Pennsylvania, for repair. Update: The flower clock is an Eastern Shore Art Association 'public art' project mostly-funded through its Committee on Public Art's $17K donation in 2013. Total cost was about $25K. Update: The city council approved these measures at a subequent meeting. 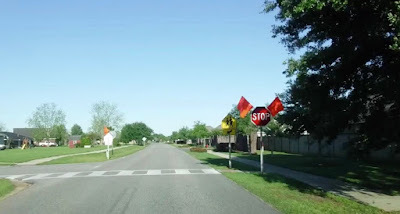 After hearing complaints from area residents about difficulty turning out onto Manley Road from side streets due to periodic high traffic volume, the city's Street and Traffic Control Committee also recommended new stop signs be installed on Manley Road at Founders Drive and Aidan Streets to help regulate school traffic in that area as well. 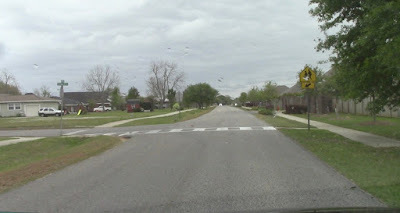 A new "raised" crosswalk was recommended in the vicinity of Kemper Lane as well, across from the Middle School. Elevating the crosswalk also acts as a speed control measure. All of the committee's recommendations must be approved by the city council. 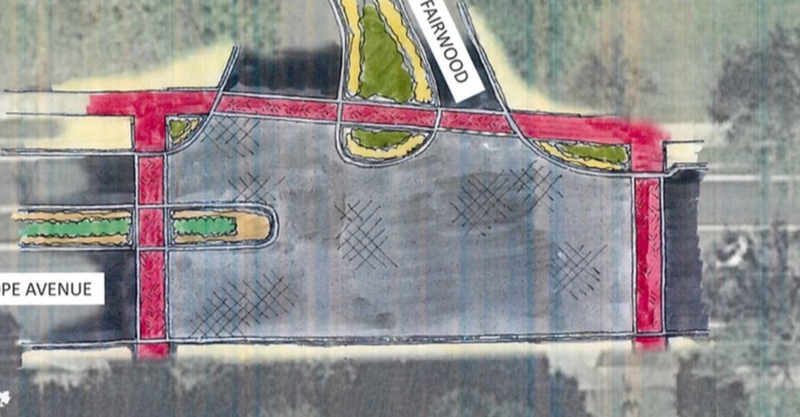 A TAP grant has been applied for for a sidewalk on Manley west to Greeno Road, according to Public Works Director Johnson. Stop sign at Aidan St. recommended too. New crosswalk proposed at Kemper Ln. 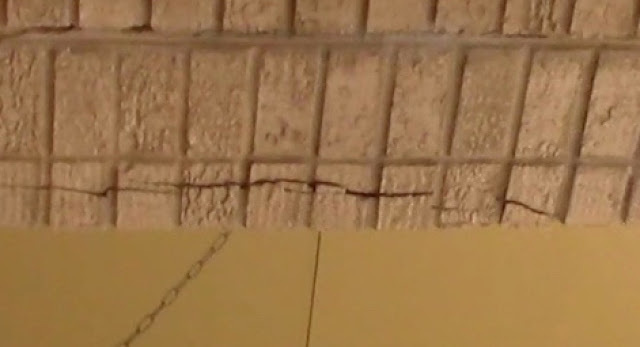 Due to more storm water intrusion from the roof-area corroding rebar embedded within the structure, some of the bricks at the bottom have cracked. 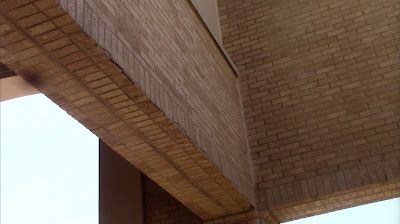 Since it was not included in the original repair contract, fixing this problem may require additional work and funding, he said.